l/r Emil Blums, Luke Milne, Elan Tang, William Ford, Carmen Bermudez, Alex Gunn (Tutor). Tutors Alex Gunn and Richie Bisset accompanied five of our students down to London earlier this week to the annual YCN Student Awards. 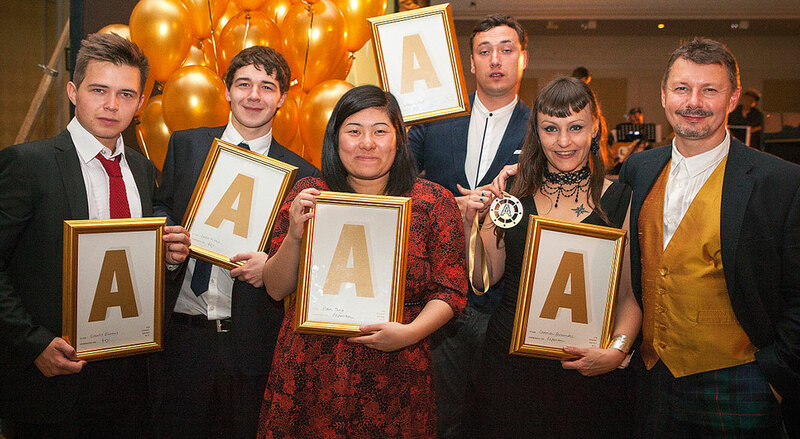 This year YCN moved from their regular awards venue at Shoreditch Town Hall to the equally impressive Marriot in Grosvenor Square. As usual the team at YCN put on an excellent show including a live band, a great atmosphere for networking, and the rather apt theme for the night - 'Gold'. Two of our HND Interactive Design students Carmen and Elan won commendations for their work on the Experian brief, whilst HND Graphic Design students Emils, Luke and William all picked up commendations for their Goji projects. Experian have asked Carmen and Elan to sign a worldwide contract to use their ideas, whilst Emils 'Goji Gorilla' idea had been under top secret development over the summer, and is rolling out at a major high street electronics retailer later this month. You can check Goji Gorilla out at Goji Collective.